Do you battle with the removal of stubborn smears, water streaks and dust build-ups from your windows? Do they cost you too much energy and you don't want to engage in this household task? This task will no longer consume a big chunk of your time and energy! The specialists of window cleaning in Highwood Hill will render you assistance! You will be able to use your spare time as you like – the fully instructed and reliable team members will manage the sweeping and scrubbing. We offer careful cleaning services for all types of glass surfaces. Read further and learn more about the different benefits you can have. We also provide our professional services in nearby areas: Totteridge & Whetstone, Oakleigh Park, Whetstone, Totteridge, Oakleigh. Improve the look of your building – the experts of commercial window cleaning will take care of that. As part of our specific technique, we use water-fed extension poles. 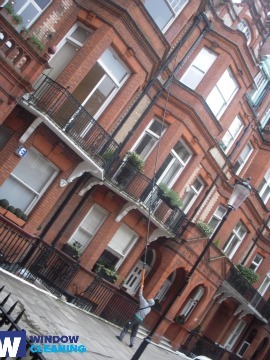 With this method, we can clean entirely the windows of your business premise, up to the fourth floor. In order to reach higher windows we use rope access. We guarantee your glass panes will look perfect, regardless the high of the building. With the assistance of the team of experts London's skyline is never going to be filthy. You can always rely on our workmanship and dedication for residential and commercial window cleaning. Our abilities allow us to clean all kinds of glass surfaces you could have at your property. For instance, you can order cleaning of small or double windows, French doors, sash windows, bay windows and patio doors. In addition, we include conservatories and skylights as part of our routine. So to speak, you can fully enjoy the good look of your windows with our swift and dependable services. We provide first class window cleaning by using advanced methods. We deliver gleaming and pristine look for your glass surfaces, skylights and conservatories with water-fed extension pole system and high pressure cleaning. The poles we use are connected to water supply devices in our vans, thus excluding the risk of damage to the exterior of your home or workplace. What's more, we use completely safe rope access methods to clean glasses on tall buildings. You can benefit from these methods instantly – give us a call on 020 3746 3113! You will be proud of your absolutely clean home after the expert window cleaners in Highwood Hill finish their work. We deliver superb services for the entire London district. The most modern methods are included in our working routine – including water-fed extension pole system and and jet washing. You will surely see the change in your home – we use purified water for the process of in and outside window washing. Call us today on 020 3746 3113. Our customer representatives will guide you and answer any questions. Or you can use our on-site booking from.